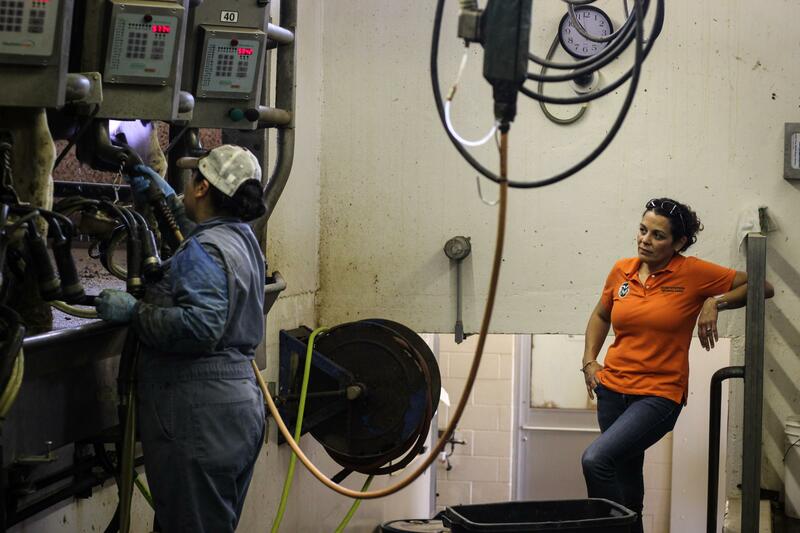 Worker Esperanza Yanez gives a cow a full physical. She says she's learned to spot a sick cow just by looking at it. As a native Spanish speaker, Noa Roman-Muniz realized the advantage of being a bilingual veterinarian. She hopes all of her students at Colorado State University will make an effort to learn Spanish. "We typically say that 'yes, we understand.' And then when we leave we stand there like, 'What was it that [the vet] said?' " she says in Spanish. A 2015 report by Texas A&M shows more than half of workers in the U.S. dairy and meat processing industries are immigrants — and many speak Spanish. So, veterinary schools across the country are pushing to open the lines of communication and ensure accurate medical care by producing more bilingual graduates. 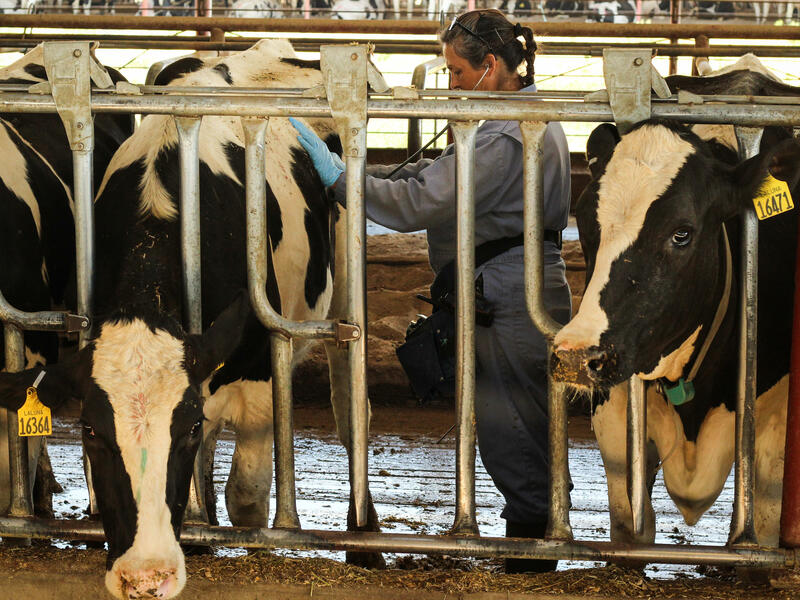 At a dairy like La Luna, in Wellington, Colo., veterinarians and workers (Yanez included) interact on a weekly basis to promote animal health and welfare. For an accurate diagnosis, vets rely on workers to describe the animal's recent behavior. And to properly care for the animal — and protect consumers — the workers are expected to carry out complex dietary and medication instructions. Yanez has managed to teach herself English through evening classes; she practices by watching game shows in English, like Wheel of Fortune. But Yanez and the other workers say they'd feel more confident working with a veterinarian who speaks Spanish. 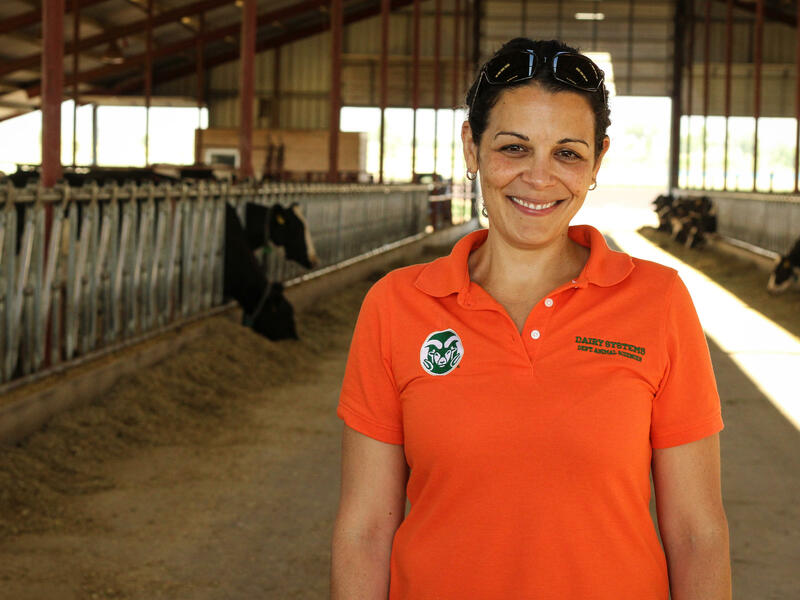 Noa Roman-Muniz grew up on a dairy farm in Puerto Rico. 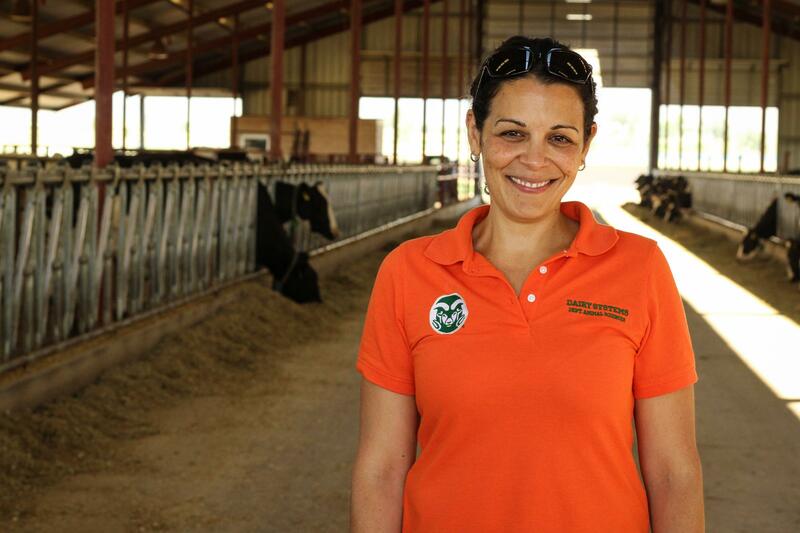 While completing her internship at Colorado State University's veterinary hospital, she quickly realized she was the only Spanish-speaker in the group of veterinarians. "I was able to explain to the caretakers, to the dairy workers, why do we need to medicate a cow in a certain way, how do we need to inject her with that medication, and that's vital," she says. As part of her job at CSU, she brings students to perform work and research at La Luna. 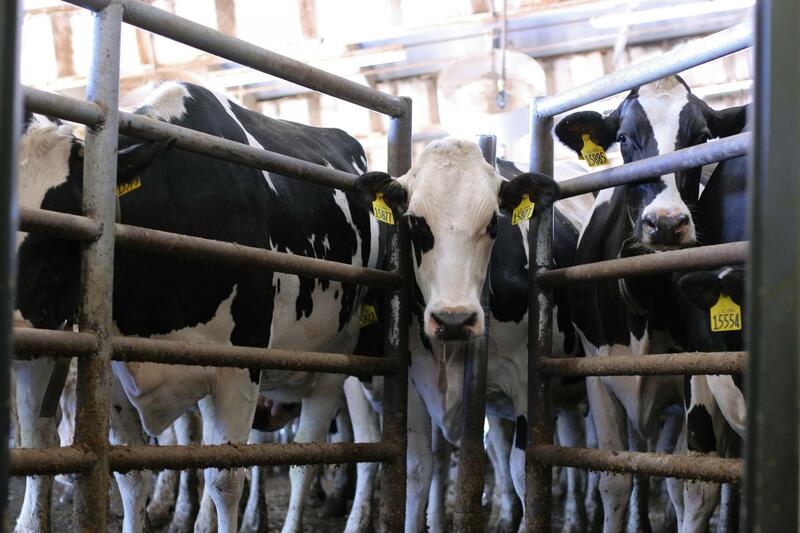 On a recent Tuesday morning, she surveyed the dairy and checked in with the workers about their day and whether there were updates on sick or pregnant cows. To get a leg-up in the job market, she says she thinks all veterinary students should learn Spanish, though she often hears the question, "Why don't the workers learn English?" "I think it would benefit them to learn English," she says. "And they try. They're doing their best. I just think that English-speakers could make an effort to learn Spanish and then we'd bridge that gap a lot more efficiently." 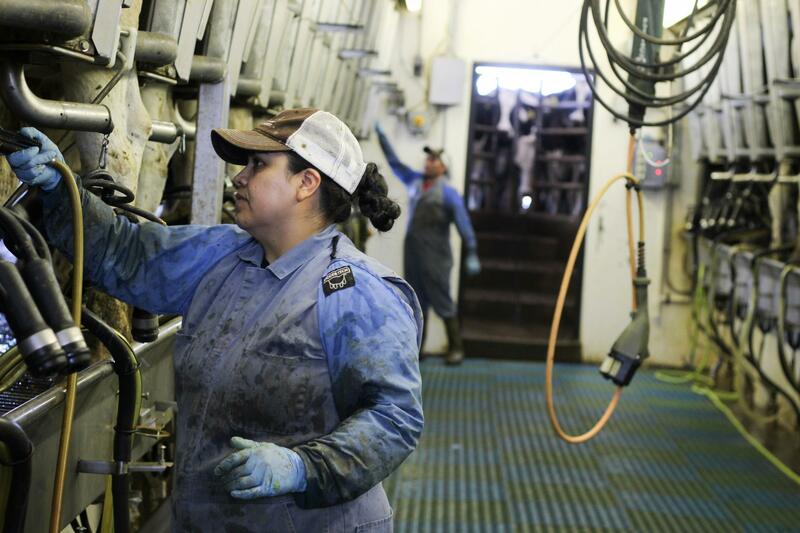 The reality, Roman-Muniz says, is that barriers exist: Language classes are costly, and few people have the stamina to learn after working a 10-hour shift at the dairy farm. Additionally, the Pew Research Center has shown immigrants tend to have lower levels of education when compared to native-born citizens. The need for Spanish has been on the radar of top universities for the past decade, according to the Association of American Veterinary Medical Colleges. The schools have responded. Purdue has a Spanish podcast for veterinary students, and Kansas State and Texas A&M both offer classes that teach Spanish for animal health care. Roman-Muniz worked with professor Maura Velazquez-Castillo and instructor Shannon Zeller to design a series of courses that streamline Spanish for CSU undergraduate students interested in veterinary medicine. In the future, a similar program will be offered exclusively to students at CSU's college of veterinary medicine. Instead of teaching general fluency, CSU students learn only the verbs and vocabulary they need for working in the field — like explaining how to properly use vaccinations (necesita guardar las vacunas en hieleras) or describing a horse that has colic (el garañón empezó a patearse la panza, echarse al suelo y dejar de comer). "We have so much Spanish-speaking culture within our borders that I think language departments are becoming more aware of meeting the needs," says Zeller, who wants to replicate the class for professionals who work with construction workers, migrant farmworkers and in hospitality. La Luna Dairy owner Jon Slutsky says that if given the choice between two equally skilled veterinarians, he prefers the candidate who speaks Spanish. He has just one full-time employee, the manager, who is not a native speaker, but he's picked up Spanish out of necessity. "It's not an easy job," Slutsky says. "There's a lot on a dairy; a lot of science as well as a lot of physical labor. And people need to understand what they're doing and why." Of course, workers like Yanez don't just follow instructions — they can be resources for owners and veterinarians. That's because years of experience and the time they spend with the animals gives them skills for reading their behavior. The key, Yanez says, is being able to communicate that. "Sometimes [the vet] thinks they have one thing, and I think they have something else," she says. If the two parties could understand each other, she says, "if they could speak Spanish and we could speak English," the farm would run more smoothly.